Ah, Europe. The home of beautiful art, high-class fashion, delicious food and some pretty weird trends. Although they are not spoken about as much as the more glamorous side of things, there are certainly plenty of odd, unusual and downright weird customs, traditions and trends. Here are some of the most bizarre. Morbid, yet practical, in Sweden when you get into your later years you are expected to start going through your worldly belongings, getting rid of things that are non-essential. This is to reduce the burden on their family when they pass away with having to clear out their homes. Popular in the Netherlands, this cosmetic procedure involves putting jewelry in your eye…! This is not something that is likely to make its way to America, as it is not approved by the Food and Drug Administration and it has even been made illegal in Illinois. The English like to pretend that they are always poised and composed, but at this annual event in Gloucestershire, all of that pretense goes out of the window. For no apparent reason, since the 19th Century, a huge number of people head to Cooper’s Hill and chase a wheel of cheese down it. 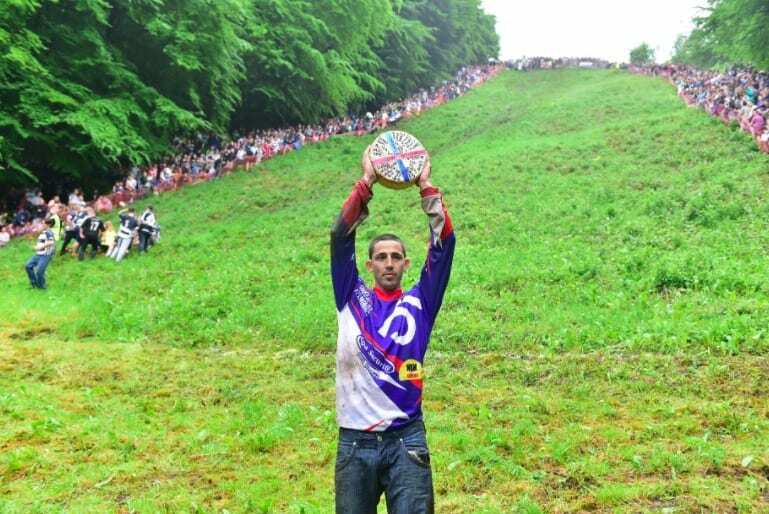 Watched by thousands of spectators, contestants hurl themselves down the hill, to try and win the wheel of cheese. Once popular in Scotland, this bizarre tradition has apparently been making a bit of a comeback in recent years. This tradition involves the bride and groom being fake “kidnapped’ by their friends and covered in things such as flour, custard, or even soot, with feathers on top! It is supposed to be good luck, although it is hard to see how! A terrifying (although surprisingly with no past injuries reported) tradition that has been popular in Spain for hundreds of years, baby jumping is an odd game. People dress as devils and jump over babies that were born the previous year, as it is believed that this will keep them safe from disease and misfortune. While every other country is trying to outdo each other with the most exciting TV shows, Norway has the monopoly on boring TV shows, which they call ‘Slow TV.’ The idea is that it is something to have in the background while they are doing something that requires more attention. For example, it could be a wood burning fire, people knitting, or even a train ride. This is one tradition that we would love to see come over to the US. Russefeiring is the Norway celebration of graduation which lasts an entire month! It is a long-standing tradition that has been around since 1905, and the theory behind it is that it is a big blow out that you only get to do one time, so go hard, or go home, as they say! So next time you think that Europe is the epicenter of cool, remember that every family has its’ crazies and Europe is no different!